In Northern Island near the town of Enniskillen is a UNESCO World Heritage site called Marble Arch Caves. It is a sight well worth seeing. After viewing the exhibits which describe how the caves came into being and how 2 adventurers discovered what you see today, you start your adventure. Leaving the interpretive centre, you take a lovely walk through the woods viewing the beginnings of the limestone, then descending down the winding steps to the cave entrance. The tour takes approximately an hour and fifteen minutes. There are a little over 100 steps going down and up out of the cave at the end. The temperature in the cave is cold, we felt it was in the 50’s Fahrenheit so warm clothes should be taken for the tour. A knowledgeable guide in geology takes you through the cave. The tours start on a boat through the early part of the tour then walking through the rest. The views are breathtaking. 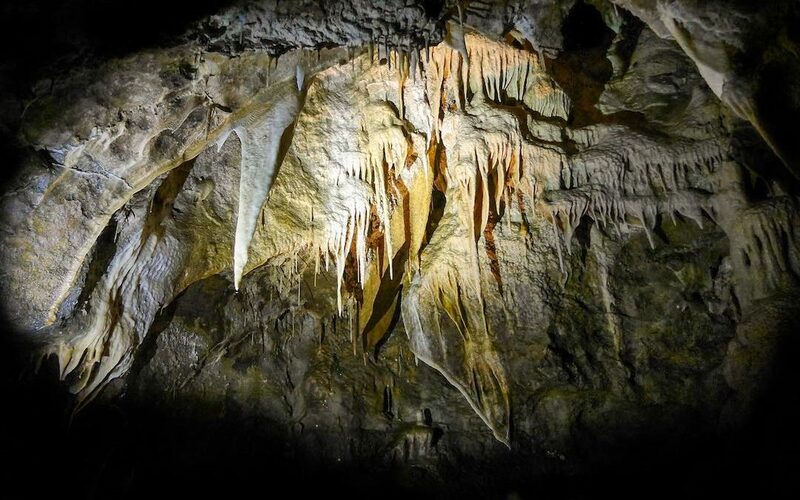 The cave has highlighted lighting to give you an opportunity to see the detailed formations inside. The stone formations have great variety and often reflect into the water below, giving a magical view. The guide helps you understand how they were formed and discovered. She brings the 1895 discovery of the caves to life by taking you through the digging and exploration of French cave explorer Edouard Alfred Martel and Dublin scientist Lyster Jameson as you proceed through the cave. We found the model in the interpretive centre even more interesting to view after we visited the cave. This is a site not to miss if you are visiting the Lough Erne area.